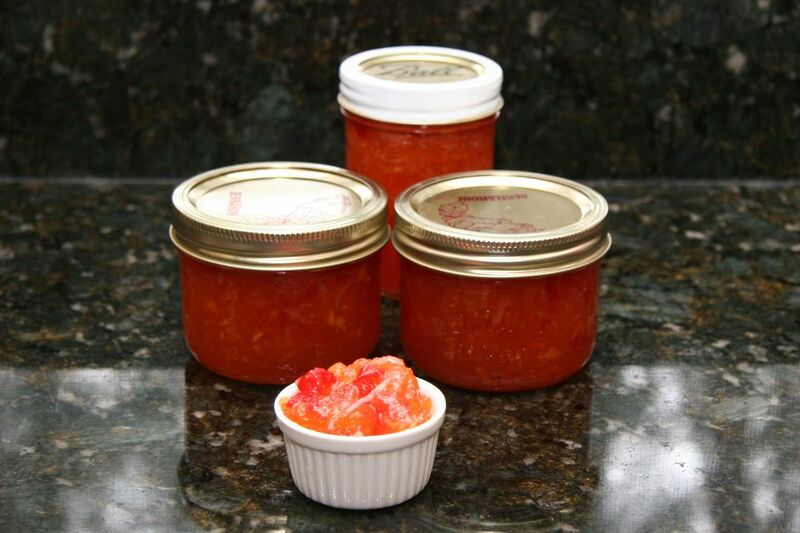 This easy hot pepper jelly is made with a combination of sweet bell peppers and hot red peppers. You may substitute crushed dried red pepper for the fresh hot peppers. The liquid pectin makes this an easy preparation. If you are new to home canning, take a look at this article about jar preparation and boiling water processing. Wash the jars, lids, and bands and rinse well. Fill a canner with water; place the jars on the rack. Cover the canner and bring the water to a simmer over medium heat. Reduce the heat to low to keep the jars hot until you fill them. In a small saucepan, bring the lids just to a simmer, but do not boil. Keep them hot over very low heat until you are ready to seal the jars. Remove the stems from the peppers; remove seeds and chop. Grind all of the peppers finely with a food grinder, food processor, or stand mixer with grinder attachment. In a nonreactive pot — stainless steel or enamel-lined — combine the finely ground peppers and their juice and pulp with the sugar and vinegar. Add green food coloring and pectin. Stir well. Bring mixture to a rolling boil over high heat; reduce heat and boil for 1 minute. Remove from heat and ladle the mixture into hot dry, sterilized half-pint jars, leaving a scant 1/4-inch head space. Seal immediately with the lids. Screw on the bands; don't overtighten. Process in a hot water bath for 15 minutes; remove jars and let the jars cool upright. Make sure the processing water is about 1 inch above the tops of the jars. The jars should not be touching. If a jar does not seal for some reason, you can refrigerate it to be eaten first. Or remove the lid and check the jar rim for nicks or food pieces. Also, check the bands. Rusty or bent bands can cause a bad seal. Discard the original lid and seal with a new simmered lid. Process again as directed. Re-use of undamaged screw on bands is fine, but never re-use jar lids.